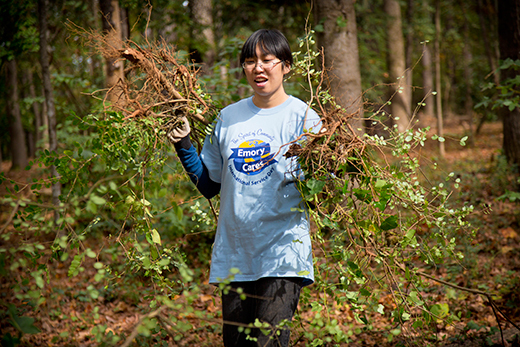 Emory Cares International Service Day is Saturday, Nov. 14, offering a variety of opportunities to improve communities, help individuals, raise awareness of critical issues and more. The annual event is a partnership between Volunteer Emory and the Emory Alumni Association (EAA), uniting hundreds of students, alumni, staff, faculty, family members and friends in a day of volunteering. "Volunteer Emory has registration space for over 600 participants," says Lisa Kendall, interim director for community engagement. "In combination with the Emory Alumni Association, Atlanta will have over 1,000 participants." For Volunteer Emory projects, registration opens on OrgSync on Oct. 28 and closes Nov. 11. Faculty, staff and students who do not have an OrgSync account will need to sign up on that website. A link to Emory's OrgSync is on the Office of Student Leadership and Service page. "Most of our projects fill up quickly, so everyone interested in participating must register," Kendall says. For Emory Alumni Association projects, "students and staff can register for our projects on the iModules platform," says Venus Austin, EAA communications specialist. Emory Cares Day kicks off at 11:30 a.m. on Nov. 14 in the Coke Commons of the Dobbs University Center. Transportation is provided for all of Volunteer Emory's projects. Buses depart around noon and will arrive back at campus around 4 p.m.
"T-shirts are handed out to each participant on the bus en route to the service sites," Kendall says. She adds that faculty and staff are welcome to contact her for more information by email or at 404-727-6169. If a department wants to register as a group for a project, she will also facilitate that. • NAMES Project Foundation, international custodian of the AIDS Memorial Quilt, needs volunteers to assist with administrative tasks and pulling and packing Quilt blocks for upcoming World AIDS Day. • Catalyst Sports' volunteers will help with a 22-kilometer walk through Atlanta, handing out water and assisting with registration of walkers who raise awareness for the 22 veterans who commit suicide every day. • Concrete Jungle picks most of the food from unused fruit and nut trees around metro Atlanta and then donates the harvest to those in need. It will have volunteers harvesting the last of fall crops, turning over beds, working on the compost pile and removing kudzu roots. • Clyde Shepherd Nature Preserve needs volunteers to assist with painting, trail maintenance and invasive species removal. • Global Growers, which works to support opportunities for sustainable agriculture in Georgia and works with legal refugees from around the world, needs help weeding, mulching, pruning and harvesting. • Historic Oakland Foundation, which maintains Historic Oakland Cemetery, will have volunteers help plant new trees, shrubs and bulbs. • Send-a-Smile delivers handmade cards to hospitalized children around metro Atlanta. Volunteers will make winter cards for shelters and hospitals. • Graduation Generation, which aims to increase the academic success rates of K-12 students, will have volunteers assisting an English/language arts class with an art project. • Kittredge Park needs volunteers to weed trails, mulch trails and remove invasive species. • Operation Street Harvest volunteers will help sort, organize and hang clothes in a thrift shop, as well as work with marketing and advertising. • Atlanta Harm Reduction Coalition needs assistance producing outreach supplies. Volunteers will learn about harm reduction. • Park Pride volunteers will clean up litter and trash and remove invasive plants. • Clarkston Community Center volunteers will plant shrubs, weed the organic community garden, prepare pathways and spread woodchips. • Open Hand Atlanta volunteers will deliver meals to families across Atlanta. • The Gateway Center will provide for volunteers an orientation to homelessness, and then have them assist with painting, a fingernail clinic and working with a clothing closet. • Decatur Cooperative Ministry volunteers will clean the new location of the Homelessness Prevention Program as well as set the community pantry and clean various spaces. • A.G. Rhodes Health & Rehab is where volunteers will participate in activities involving interaction with residents, including games, arts and crafts, and resident visitation. • Jars of Clay, aiding southwest Atlanta families with emergency housing, food and other services, needs volunteers to set up a new shelter/daycare space, painting and putting up posters and setting up cubby holes. • International Women's House needs volunteers to sort donated items, interact with the children and assist in light yard work. The EAA will have projects working with Books for Africa; Habitat for Humanity; Lost-N-Found Youth; MedShare; Metro Task Force for The Homeless; Newton County Foster Care; and Trees Atlanta. In addition, volunteers through the alumni association will be part of the project at the International Women's House. See the Emory Alumni Association website to find out where alumni are serving across the country and around the globe.